Like the military jacket, the bottle is clearly reminiscent of the architecture of the House of Balmain. The metallic epaulettes embellish the midnight blue glass. A Balmain button-inspired eagle provides the majestic finishing touch at the apex of the piece. 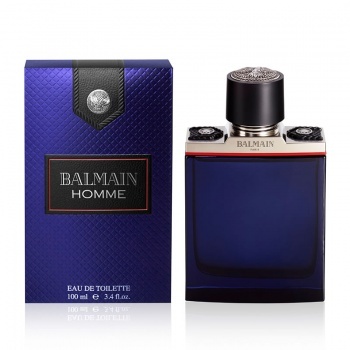 Balmain Homme is a woody, oriental scent. The metallic freshness of bergamot complements the thrill of spices. Saffron and nutmeg provide a sensation that is as sensual as it is crisp. The perfume resonates with leather like a second skin and the subtle violet leaf provides an unexpected forbidden fruit accord. A the base of the fragrance, cedar wood fuses with the sweetness of tonka bean, becoming deeper after coming into contact with the moss. Gift Set includes EDT 60ml and Shower Gel 100ml. 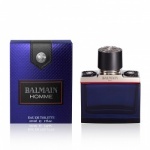 Balmain Homme is a woody, oriental scent. The metallic freshness of bergamot complements the thrill of spices. Balmain Homme is a woody, oriental scent. The metallic freshness of bergamot complements the thrill of spices.